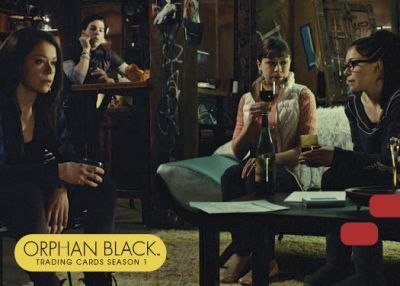 Showcasing a cardboard look at the popular sci-fi series, 2016 Cryptozoic Orphan Black Season 1 tackles the mysterious circumstances surrounding Sarah Manning and her many clones. Each hobby box includes one autograph and one wardrobe relic card. 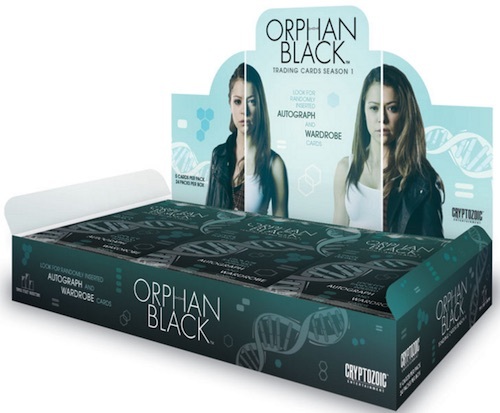 The ten episodes of Season 1 are featured on the 72-card base set. 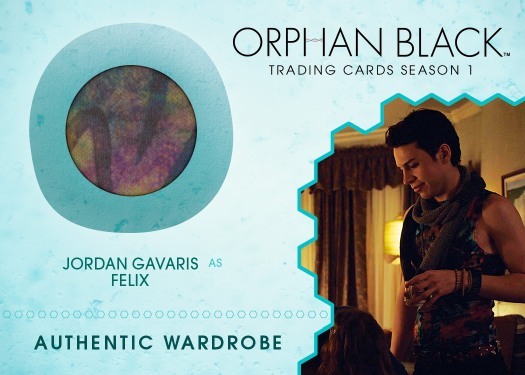 The cards offer show images from each episode of the debut season. In addition to the detailed base set, collectors have several inserts to chase. 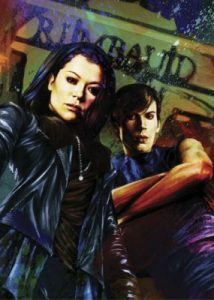 This includes Character Bios, Felix's Loft and Quotes, each falling at 1:3 packs. More rare, IDW Comic Covers (1:36 packs) displays a more artistic look. One-of-one Printing Plates parallel the base set and select inserts. On the premium side of things, Autographs average one per box and there are also show-worn Wardrobe (1:24 packs) and Dual Wardrobe (1:144 packs) cards. 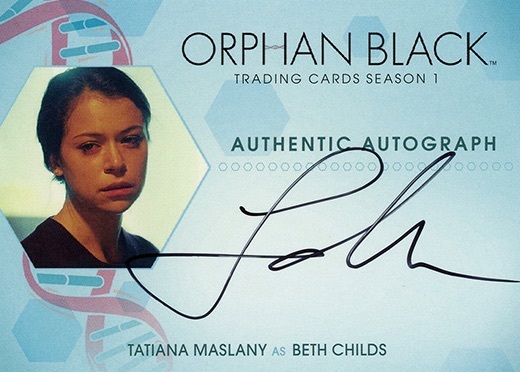 Autographs have an added variant wrinkle that speaks directly to the intricacies of the show as star Tatiana Maslany has signed for several of her characters. There are also limited case incentives through GTS Distribution that feature exclusive autograph variants limited to less than 35 copies. Beyond the main product, a special custom album is separately available for the release. Each colorful binder contains an exclusive replica Dyad Institute swipe key. 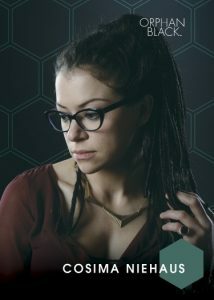 Season 2 of Orphan Black is also covered with a follow-up set from Cryptozoic. PARALLEL CARDS: Silver Foil Board - 1:3*, Printing Plates - 1:86*. 11 Just one. I’m a few. 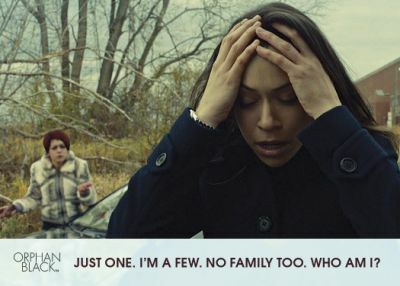 No family too. Who am I? 12 What do I do with the body? 33 Copy cop, who are you? 24 cards and 15 total signers. 1:24 packs. Q1 Aren’t you an odd duck? Q2 Aren’t you supposed to wait like three days before rising? Q3 I don’t do backup. I don’t even know what backup is. Q4 Fetch me something gay. Q5 You cannot hide in minimalist furniture. 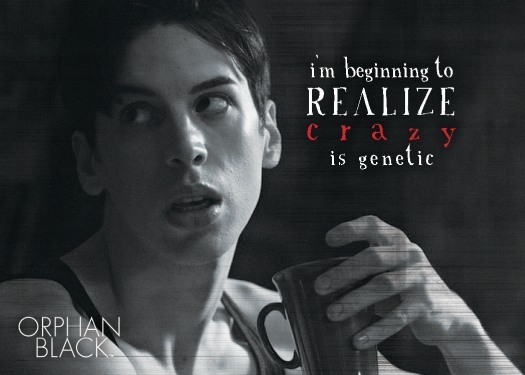 Q6 I’m beginning to realize crazy is genetic. Q7 Well, unleash the doves. Q8 I don’t leave prints when I burgle. Q9 Is every man in your life a complete wanker except me? 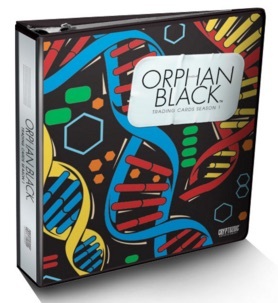 Shop for 2016 Cryptozoic Orphan Black Season 1 boxes on eBay. DO we know if these actually released? Randall S � They have not released. The official date is unknown at this point. Likely to be this summer.